Be the first to share your favorite memory, photo or story of Earl. This memorial page is dedicated for family, friends and future generations to celebrate the life of their loved one. 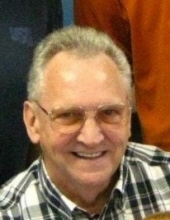 Earl Lynn, age 77, beloved husband of the late Betty Jane Lukemire (nee Cullum), loving father of Casey (Penny) Lukemire and Kelly (Thomas) Davis, loving stepfather of James (Vickey) McLane, Curtiss L. (Cindy) McLane, Beverly A. (Joe) Phillips, Kenneth (Rosemary) McLane and Diana R. (Dennis) Brinson, also survived by many grandchildren and great-grandchildren. Services will be held at the Maham Funeral Home, 187 North Second Street, Williamsburg, Ohio on October 25, 2018 at 1pm. Visitation will be from 11am until the time of service at the funeral home. To send flowers or a remembrance gift to the family of Earl Lynn Lukemire, please visit our Tribute Store. Deliver flowers Wednesday from 10am until 4pm. "Email Address" would like to share the life celebration of Earl Lynn Lukemire. Click on the "link" to go to share a favorite memory or leave a condolence message for the family.